Braintree. Qualify for PCI compliance & protect your customers from cyber-threats & your business from security breaches. Visit braintreepayments.com/twist. 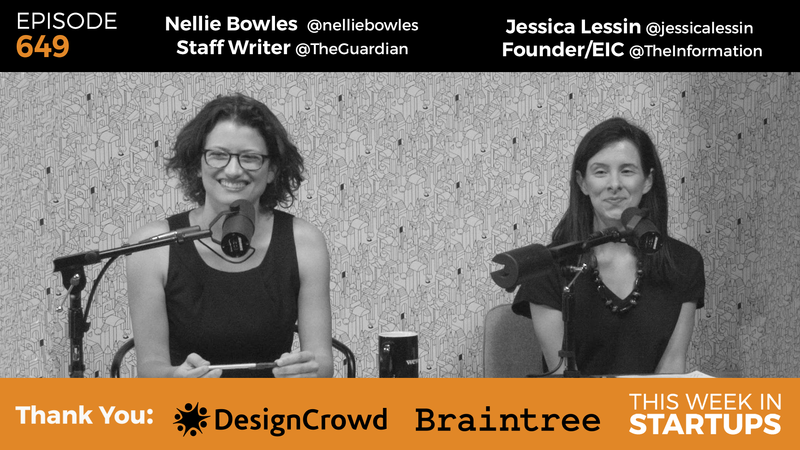 Episode 649 of This Week in Startups is a News Roundtable featuring Jessica Lessin, founder and editor-in-chief of The Information, and Nellie Bowles, staff writer for The Guardian. Jason riffs with the distinguished journalists on the polarizing and ongoing dispute between Peter Thiel and Gawker. Then, the discussion turns to include everything from the Trump campaign, to journalistic politics, and moral responsibility in the tech industry. By secretly funding a lawsuit against Gawker for writing articles about himself, his friends and his family that have “ruined people’s lives for no reason,” Peter Thiel has been making headlines. Jessica feels this story has been blown up by the media, and that every part of what Thiel is doing is well within the rights of the legal system. Nellie feels quite differently about this story. She agrees that what he is doing is legal, but believes it to be essentially “un-American.” She thinks it is a slippery slope for us to be ok with Billionaires crushing publications simply because they are written in a negative light. Some can survive a lawsuit of this size, but most cannot. The group discusses the thin line in journalism between the public’s right to know and the right to personal privacy, particularly in regards to closeted public figures. Jason says, “If you’re out to the gay community it doesn’t mean you’re out to the wider community.” His point being that there can be massive repercussions for certain people who don’t necessarily want their sexuality to be public knowledge. The politics surrounding this type of journalism are hard, but the consensus with the group seems to value privacy in instances like Tim Cook and Peter Thiel being outed against their wishes. Are investigative journalists in tech too soft? Nellie believes that tech journalists are not nearly aggressive enough, and sees that lack of offensive reporting as a huge issue. She cites the Theranos scandal as a massive embarrassment for Silicon Valley journalists, in that, “it took a guy from Brooklyn (John Carreyrou) to break the story.” Jessica, on the other hand, feels that it’s an unfair generalization. She is more concerned with “having a business model and organization that can support investigative journalism… and that’s going to come from all different places,” and it is unnecessary to worry about whether or not the journalists have thick enough skin. How would a Trump presidency impact Silicon Valley? As an insider on this topic, Jessica can say that the possibility of Donald Trump becoming our nation’s Commander in Chief, it is a scary atmosphere for tech, especially with regards to his position on immigration. She makes a meaningful point in that, “Silicon Valley is generally pro global trade and pro-immigration.” She then explains the lack of pushing Trump to explain exact policies that he is proposing, and that as the general election approaches we will see more of that. But overall, Silicon Valley is certainly fearful of the possibility of Trump being elected. Jessica explains how Facebook needs to maintain an unbiased and neutral platform, which translates to a need to maintain a moralistically neutral stance in the media as well. Then, Jason enlightens us with an epic rant on the responsibility and obligation that tech moguls such as Mark Zuckerberg have to stand up and take a public stance against political positions that are ethically backward. 0:28-1:38: Jason introduces the roundtable’s lineup and jumps right into the divisive Thiel vs. Gawker story. 1:38-5:21: Jessica believes “the media has gone into sensationalist mode” over this story. Nellie disagrees. 5:21-7:23: Nellie explains why she finds Thiel’s behavior un-American. 7:23-14:58: Jason shares a clever test he ran to see if Gawker checks their sources. 17:15-19:07: Jason gives a little more background on the current careers of his guests. 19:07-26:58: The topic goes back to the Thiel v. Gawker controversy and the roots of the rift itself… outing gay men against their will. 26:58-29:28: Jason brings up a complication that raises some slight tension at the roundtable. 34:47-36:12: Both journalists at the roundtable wrote pieces on the infamous Thiel vs. Gawker story. 36:12-41:03: Nellie explains the story of Vinod Khosla blocking beach access. 41:03-44:28: Jason has some advice for Peter Thiel. 44:28-49:36: Jessica shares her admiration for Buzzfeed’s refusal to advertise for Donald Trump, and her opinion on Trump’s potential impact on Silicon Valley. 49:36-52:25: The group discusses their takes on the Facebook ‘trending topics’ controversy. 58:05-1:02:45: Jessica has to leave due to the program running over, but Nellie and Jason continue the roundtable a bit longer.